It should come as no surprise that I like action figures, always have and probably always will. 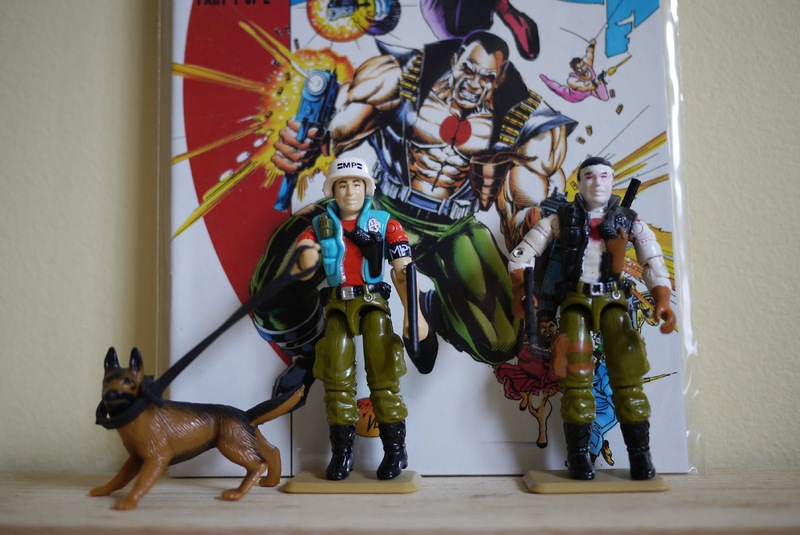 It's unfortunate that so many cool characters from comic books, cartoons, video games, and other media never receive the action figure treatment. What's a person to do when that happens? Make their own toys of course. Well, not actually make one from scratch but you can take one toy and using some paint and creativity turn it into something else. I did just that a couple times many, many years ago. 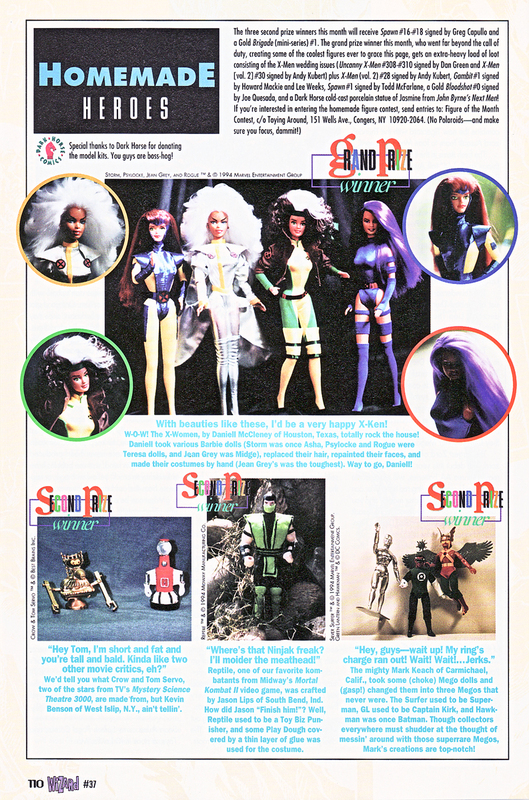 It was Wizard magazine (1991-2011) that inspired me to try such a thing as they had a column about toys called Toying Around and within that column they often highlighted fan creations in a section titled Homemade Heroes. The best creations would win a prize and people made a lot of great looking toys, nothing I could compete with so I never did submit my one completed action figure. The winner in the image I'm including used Barbie dolls rather than action figures which is more challenging since they had to make clothing and work on the hair. It's really quite impressive as they look as if Mattel itself made them. The one character I actually completed is Valiant Comics' Bloodshot. Valiant has video game connections too as Acclaim purchased the company in 1994 which led to a few games, including Turok, Shadowman, and a crossover between X-O Manowar and Iron Man. Eternal Warrior was my favorite Valiant comic book in the '90s but Bloodshot, who made his debut in an issue of Eternal Warrior, is more interesting to look at and generally cooler overall. He is a former soldier that has nanites in his blood giving him regenerative powers, increased strength and agility, the ability to interface with machines, and the nanites even allow him to change his appearance. Although his white skin and the red circle on his chest make him look like a Japanese flag, he is an Italian American character that was in the mafia. However, the project that gave him his powers was led by a Japanese scientist. 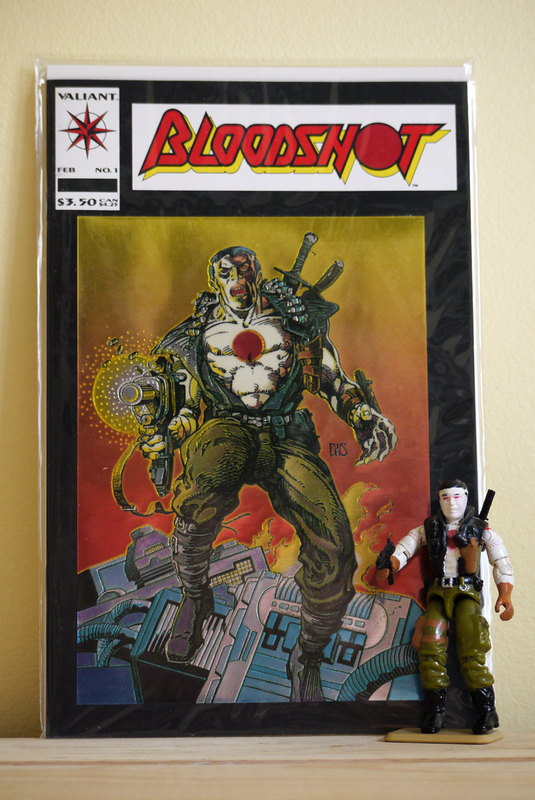 Bloodshot in front of issue #1. My decision to go with Bloodshot was also influenced by a G.I. Joe character that I had a duplicate of. The toy is Law & Order which is a M.P. guard (Law) and his dog (Order). I used my first Order in a school project and it was stolen (along with Snake Eyes' wolf) so I got another one to replace the dog and thus, ended up with two Laws. Law's clothing looked like it would be a good match for Bloodshot which was the primary reason I selected Bloodshot. There wasn't a lot to do with this one other than repaint the various parts of Law and select a couple weapons. 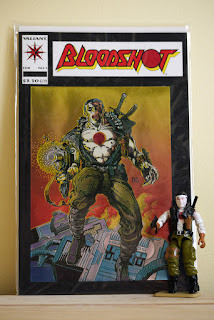 Bloodshot fights with machine guns and blades making him simple enough to arm. It's not perfect and I'd rather he wasn't smiling, though I think it is obvious that the toy is Bloodshot. Some of the paint has since come off around the shoulders and the face looks a bit rough so there is probably a better type of paint that I should have used. Before and after: G.I. Joe's Law & Order side-by-side with Bloodshot. You could say I completed two characters but the other was a simple sculpt out of Play-Doh that I made of Sludge from Malibu Comics. 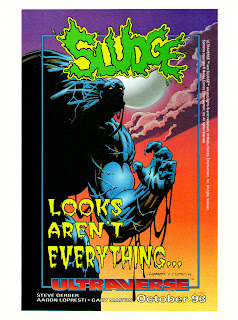 I doubt many people know who Sludge is and over the years the Play-Doh started crumbling so I tossed it. The last character I attempted to create I still have in the unfinished state and haven't touched it since 1995 I'd guess. It's actually not far from completion but I never purchased clay or found a good pig to cut a hole in. A pig you say? 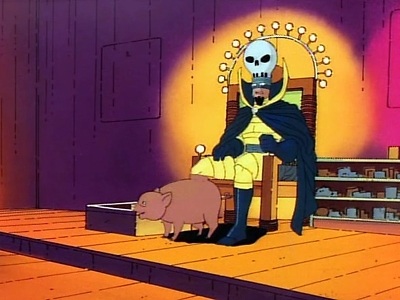 Can you guess what action figure would require a pig? He's probably a bit obscure as well but comes from a great cartoon that is based on a comic book. Although I've not read the comic book, The Tick is one of the funniest cartoons I've seen with a great cast of oddball characters. 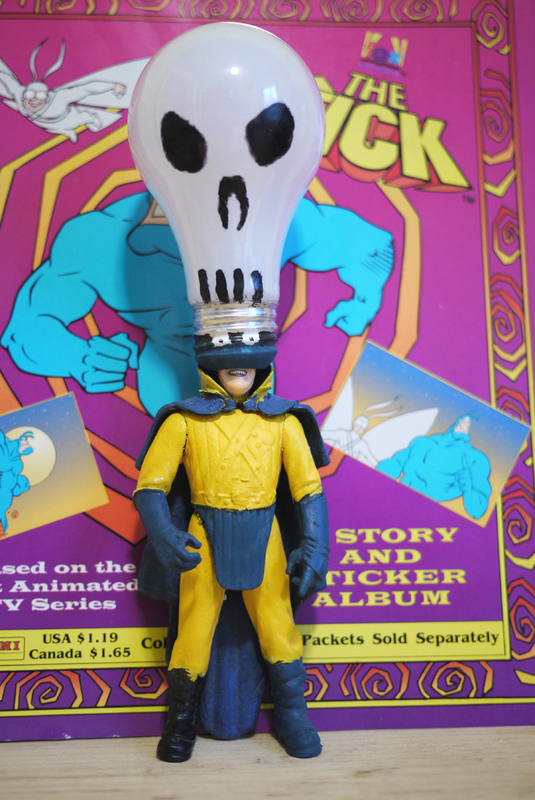 My favorite good guy from The Tick is Sewer Urchin but he got his action figure and that is the one toy I own from the cartoon. It's my favorite bad guy that I tried my hand at creating: The Deadly Bulb. Why the Deadly Bulb? I've not seen the cartoon in quite some time that I can hardly remember but his appearance is so ridiculous that it is still amazing. The Deadly Bulb has a light bulb on his head and the bottom half of his right leg is a pig. Yes, a real pig! 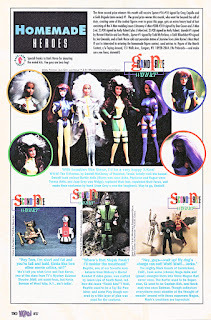 The base action figure used is Beldar of the Coneheads from the Saturday Night Live skit turned into a movie that also received a toy line from Playmates. I was working in a toy store at the time and we'd have bins of discounted toys. Once I saw the Conehead I thought that would be perfect and it was only 97 cents I believe, plus I got 25% off with my employee discount so not much of an investment was needed. 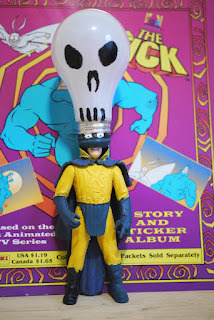 My assumption was I could put a real light bulb over the Conehead's cone head but once I started taking apart a light bulb I realized that wasn't going to work. The action figure still turned out to be a decent choice, however, the head had to be cut. That said, the light bulb is way too big in comparison to the size of the bulb on the character's head so I should have chosen a smaller type of bulb, though I'm not sure if it would have fit over the head. Beldar the Conehead minus the cone head. After prepping the light bulb and painting the figure three things remain: the aforementioned pig, a goatee, and the cape needs to be extended. The Conehead already had a cape which works out well, it's just not wide enough. Modeling clay would probably work here as well for both the cape and goatee, though I'm not sure if I'll ever complete the action figure. As I mentioned the light bulb is too large and looking at it now, the white on the back of the bulb has faded in one spot. Also, I had the toy packed on Styrofoam for the past 20+ years that appears to have melted a little bit onto the cape. That can be repaired with paint if I still have the same color or it can be completely repainted. Putting on and removing the bulb from the head has marked up the face too. this one is courtesy of a 2013 forum post at Comic Vine. The Deadly Bulb without a lower leg pig. After writing this I wouldn't mind creating some toys of video game characters and while I like G.I. Joes best, I really wouldn't want to paint over any more from my collection. 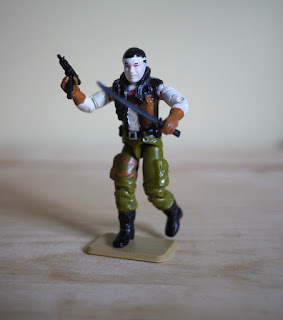 Maybe if I see some other very cheap action figures I'll consider picking one up to paint into something else. 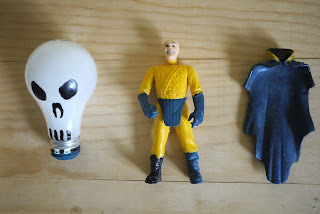 If you've ever created toys post about them in the comments and provide a link if they are visible somewhere online. The comments section doesn't allow images or I'd suggest posting it there. Thanks for reading!